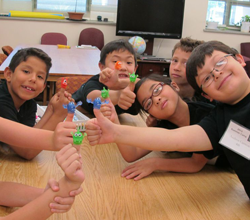 A 2013-14 study with 700 students in 48 classrooms demonstrated the effectiveness of Math Snacks games and activities when integrated into the existing curriculum. 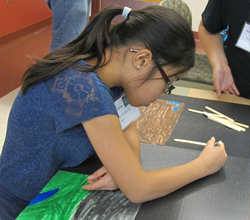 Sixth grade students showed significant gains in their understanding of key concepts when their teachers used the games for 8-12 days over a five-week period, as compared to students whose teachers used only the district curriculum. 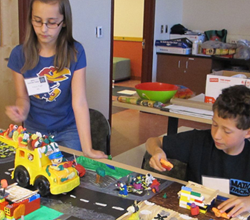 Students who used the Math Snacks games increased their understanding of the relevant math concepts, and retained that knowledge even after the use of the program. All of the teachers in the study stated they would recommend the Math Snacks lessons to other teachers, and over 90% of them plan on using them again. 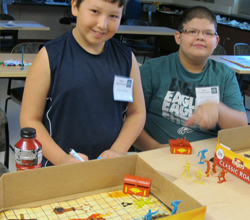 Students who used the Math Snacks lessons enjoyed the multimedia tools and the bonus activities, and a large percentage of these students used the games at home and showed them to others. Read more about the research behind Math Snacks. All Math Snacks games, animations and teaching resources are available FREE at mathsnacks.org. 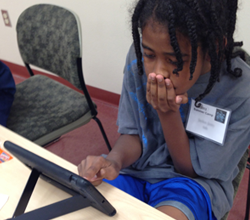 Paid apps are available at a discount to educators. 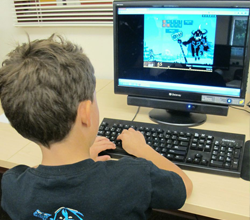 The website includes extensive teacher support materials such as teacher guides, how-to videos, and gameplay walkthroughs. All student resources (games, animations, learner guides and transcripts) are available in both English and Spanish. Before creating Math Snacks, experts at New Mexico State University identified crucial gaps in the knowledge of sixth grade students by first reviewing scores on standardized exams, and then identifying why students got these questions wrong. In doing this analysis, they defined crucial areas for math learning for all students, as well as the mathematics content areas for which teachers requested support materials. 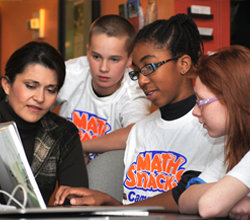 Teachers and students played an important role in the development of Math Snacks tools. 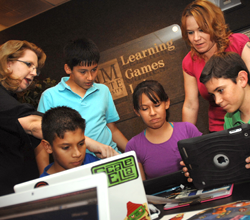 During development of the games and animations, kids participated in hundreds of user testing sessions at NMSU's Learning Games Lab. Students reviewed characters, level designs, scripts, graphics and gameplay at several stages of development to make sure the tools were enjoyable and effective. In innovative "Math Snacks Camps", teachers and students worked together to create companion activities for each Math Snacks. Even before they conducted research on the effectiveness of the Math Snacks tools, the design team knew each animation and game was appealing, easy to use, and enjoyable for teachers and students. 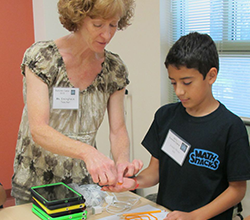 Math Snacks educator Mary Ersinghaus guides a student in a hands-on activity. 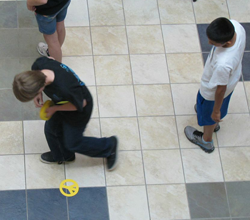 Students toss a marker toward a coordinate grid in a Game Over Gopher hands-on activity. A student plays one of the Math Snacks games on an iPad. Dr. Barbara Chamberlin and Michelle Garza, of the Learning Games Lab at New Mexico State University, work with kids testing Math Snacks during development. 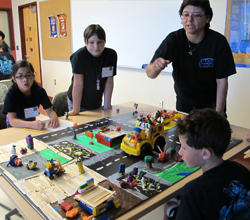 Students engage in a hands-on activity related to the Math Snacks game Monster School Bus. 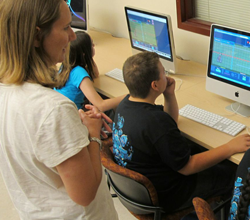 Students play Game Over Gopher in a classroom computer lab. 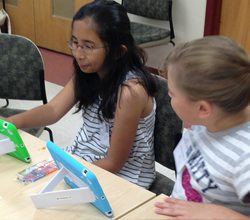 Students discuss together as they play one of the Math Snacks games on iPads. 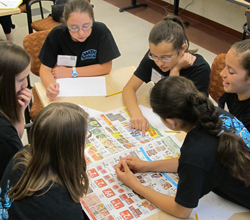 Students use a grocery insert from a newspaper as part of a Math Snacks hands-on activity. Students having fun with monster puppets in a hands-on activity related to Monster School Bus. 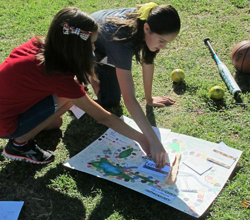 Students work together on a hands-on activity associated with the Math Snacks games. Students work together to complete the exercises in a Math Snacks Learner Guide. 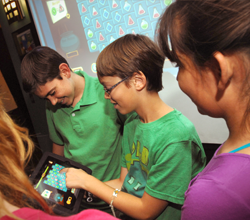 Students playing a hands-on version of Math Snacks game Monster School Bus. 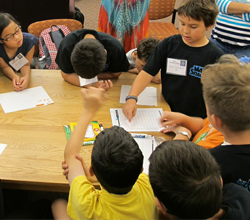 Youth playing Ratio Rumble in the Learning Games Lab at New Mexico State University during formative testing of Math Snacks games. 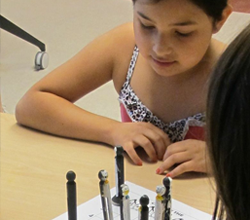 Students engage in a hands-on activity related to one of the Math Snacks games and animations. A student plays Gate in a classroom computer lab. Math Snacks educator Sharon Johnson instructs students in a hands-on activity. Students work on a hands-on activity associated with one of the Math Snacks games and animations. Dr. Karen Trujillo conducting formative testing of Math Snacks in the Learning Games Lab at New Mexico State University. In the animation “Atlantean Dodgeball,” the Belugas are keeping a close eye on player ratios. In the animation “Atlantean Dodgeball,” the Sea Urchins are keeping a close eye on player ratios. In the animation “Atlantean Dodgeball,” two teams track a game’s progress via the player ratio of Sea Urchins to Belugas. In the animation “Atlantean Dodgeball,” sportscasters track a game’s progress via the ratio of two teams’ players. In the animation “Bad Date,” a date goes badly when one side of the conversation overwhelms the other. Talking a lot more than someone else is a mathematical problem! She spoke six times words than he did. A six-to-one ratio! At the end of the animation “Bad Date,” the main character finds someone who speaks at about the rate as she does. Even fractions with numerators larger than their denominators have their own place on the number line. In the animation “Number Rights,” a passionate activist stands up for fractions and negative numbers to claim their place on the number line. Negative numbers like -2/3 should stand proudly at their place on the number line. In the animation “Overruled!” two rulers must embrace proportional units to unite their lands. In the learner activities for the animation “Overruled!” students use graphs to convert King’s Feet to Queen’s Feet, and vice versa. Ratey the Math Cat can’t resist pointing out the rates and “purr-portions” in everyday life. Ratey is interested in how much TV people watch "purrr" day. Scale Ella is a crusading superhero who uses scale factor to set things right. Enormous thumbs call for an enormous cell phone in the animation “Scale Ella,” which covers the mathematical concept of scale factor. Hand-drawn diagrams (here, of a scaled-up giant thumb) help explain math concepts with a bit of humor. The evil troll Scaleo is turning things upside down, and citizens’ only hope is… the power of mathematics. Game Over Gopher helps students find their way around the coordinate grid. In Game Over Gopher, students place tools on the coordinate grid to protect their prize carrot from marauding gophers. Game Over Gopher gives students repeated practice plotting coordinate pairs while engaging them with clever graphics and intense gameplay. In Game Over Gopher, an interactive coordinate grid overlaid on the game screen helps support conceptual understanding of axes, reflection, quadrants, and the origin. Gate uses keyboard commands to set up the place value relationship among digits, including in large numbers and decimals. Multiplication stones (here ×2) that appear in later levels of Gate offer more efficient ways to generate large numbers. Monsters, flying or lumbering toward the hero in Gate, can be turned back by building specific numbers via place value and sending them at the monsters with your magic staff. Gate’s mystical storyline keeps students engaged and rewards them for making it through the levels. In Monster School Bus, the player is a bus driver who picks up students in wacky neighborhoods. Players practice adding integers to make 10 in the early levels of Monster School Bus. In Monster School Bus picking up kids in the right order to deliver full loads to school earns potions that transform buildings. Slime kids in Monster School Bus come in various sizes. Players must add decimals to make a full load. The number line is a beautiful lagoon, and the player must dive at the correct value, to harvest pearls in the game Pearl Diver. Players must locate fractions and mixed numbers on the number line in later levels of Pearl Diver. Pearl Diver’s bonus level gives students practice in estimating fractions. Math Snacks games reward students with special graphics, messages and animations when they score well or complete all the levels. Ratio Rumble features a diverse cast of characters for players to choose from. Students enjoy the tournament aspect of Ratio Rumble and identify with the backstory of their chosen character. Ratio Rumble teaches ratios and equivalent ratios. 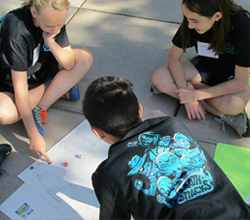 Ratio Rumble gameplay captures students’ interest so they engage with the mathematical concepts needed to advance through the tournament. Contact Us for permission to use these videos in broadcast. Do not alter the Math Snacks logo. Use it only in association with Math Snacks products.